Many people who are not in the military or don’t have close loved ones in the military believe that once a veteran comes home from war, he or she is no longer in danger and can resume a normal life. However, those who are in the military life know better. A veteran returning from combat rarely transitions easily back into civilian life. S/he may be plagued with a number of physical, mental, and/or emotional problems. 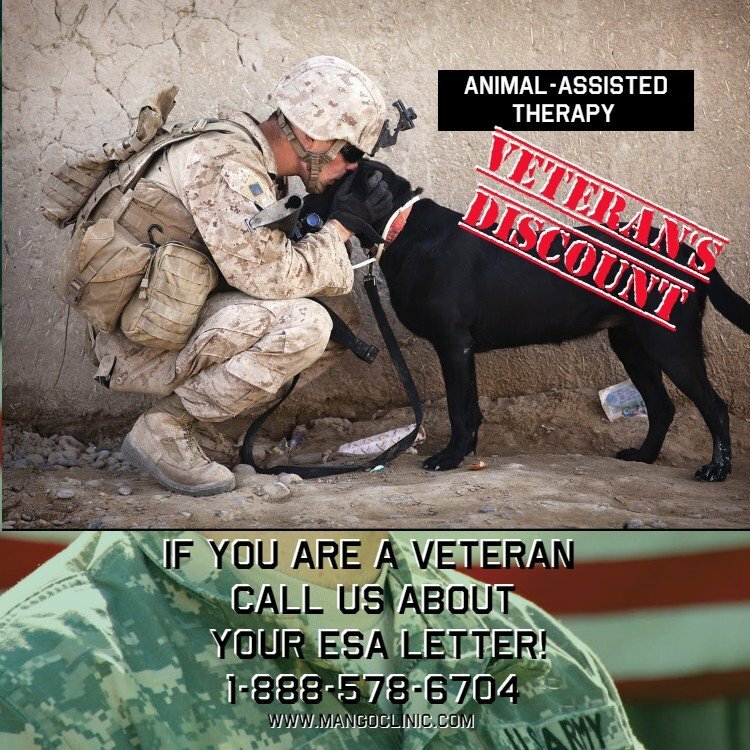 In some cases, an Emotional Support Animal (or ESA) can provide the comfort, security, and support these veterans need to heal. The most widely-recognized mental health condition suffered by combat veterans is post-traumatic stress disorder (PTSD). Those with PTSD can experience symptoms such as chronic anxiety, insomnia, sleep apnea, irrational fears, an aversion to loud noises. Oftentimes they experience difficulty or an inability to connect with or relate to others who did not experience the same traumatic events as they did. Some PTSD patients are successfully treated with counseling, cognitive behavioral therapy, or medications. However, others do not respond well to traditional treatments or find that additional therapy is needed. In addition to PTSD, veterans often experience depression, addictions, anxiety disorders, violent outbursts, and other negative consequences due to their exposure to battle-related trauma. Those who suffered a traumatic brain injury (TBI) or blast-related exposure are subject to even more symptoms such as cognitive or memory issues, headaches, inability to process information, and an increased risk in developing dementia. It is estimated that 8.5 to 14 percent of vets returning from battle experience PTSD or severe depression. Furthermore, 20 percent report experiencing a head injury severe enough to cause a concussion. Fortunately for these veterans, an ESA animal can have a number of positive effects on their conditions and help them on the road to recovery. ESAs are any type of animal that can be used for comfort and companionship for those individuals with mental or emotional disorders. Though they are not specially trained as Service Animals are, Emotional Support pets can still be of enormous benefit to those suffering from battle-related issues. Many veterans have a difficult time connecting with friends and loved ones when they return from the battlefield. Having an animal as a companion can be incredibly soothing as the veteran can experience unconditional love and undivided attention from their pet. They do not have to explain why they feel the way they do or justify any irrational thoughts or behaviors. Having a non-judgmental presence to talk to, spend time with, and grow closer to often helps the vet make the transition to re-connecting with their loved ones. Vets can also benefit from taking care of an animal’s needs. The necessity of feeding, taking a pet for walks, and grooming an animal can provide meaning to a vet’s life and help them focus on something other than their own problems. It has also been proven in studies that animal-assisted therapy such as the presence of an animal—especially a dog—can help those with sleeping issues. Patients usually get more deep sleep by mitigating anxiety. Dogs can also wake a vet from a nightmare or if they are displaying visible signs of sleep apnea. Though Emotional Support Animals do not qualify for many of the benefits that Service Animals do, they can still accompany their owner to many public places and be allowed into housing where other animals are normally not allowed. To register your pet as an Emotional Support Animal, you must have a diagnosed mental or emotional disorder and be evaluated by a qualified physician. 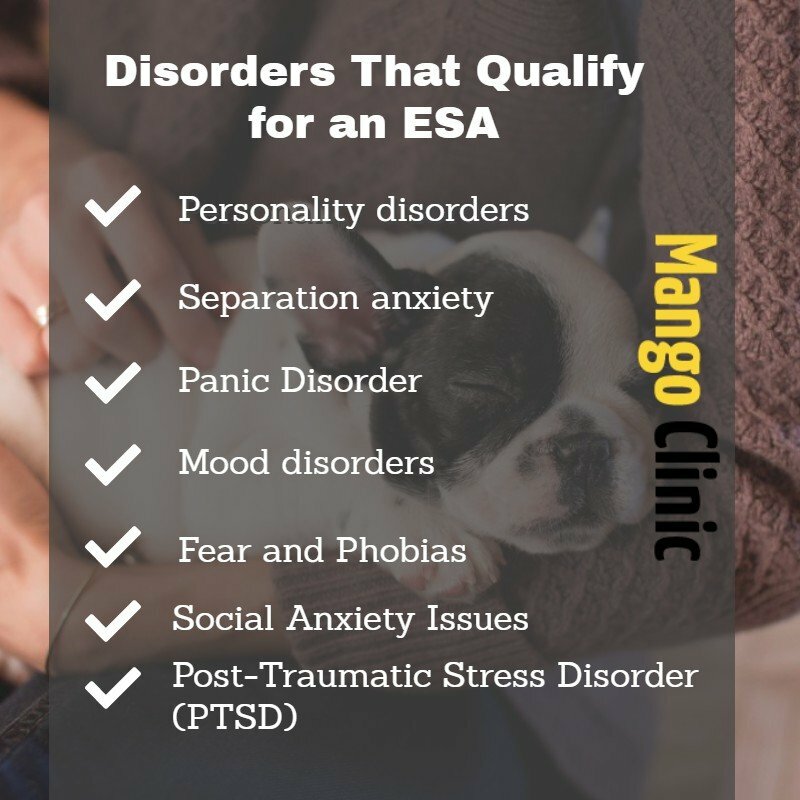 If you qualify, you will be issued a letter that you can use to distinguish your pet as an ESA so you can keep it with you to provide comfort and support. 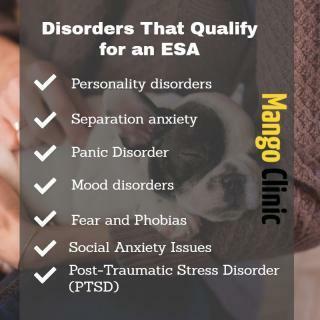 If you are a veteran and suffer from PTSD or other emotional disorder talk to a doctor at Mango Clinic to find out if you qualify for an ESA prescription. Call Mango Clinic Miami at (786) 391-0269 to schedule an appointment with a Board Certified physician. You can also complete a simple ESA Online Form to have a doctor contact your via Telehealth. previousEmotional Support Animal: What Do I Need to Qualify?